"I bartended at a comedy club in Clearwater, Florida. This was one of our specialty drinks. I think you'll enjoy this recipe." In a blender, combine ice cream, coffee liqueur, banana liqueur and pineapple juice. Blend until smooth. Drizzle chocolate syrup decoratively into a fluted glass. 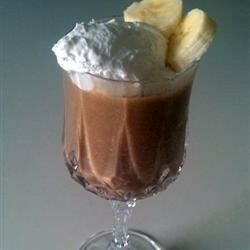 Pour blended mixture into glasses and garnish with whipped cream and a slice of banana. This recipe was ok, but needed help to be great- add a touch more coffee liqueur, a touch less banana liqueur and 4 ice cubes blended per serving. Perfection!!!! This recipes was ok. I did add alot of ice and it seemed to help, but i wasn't crazy about it. We had this on a cruise and it was fabulous!